"He's been a good batsman, a good captain and yesterday, for 12 words, he was also a good human being." 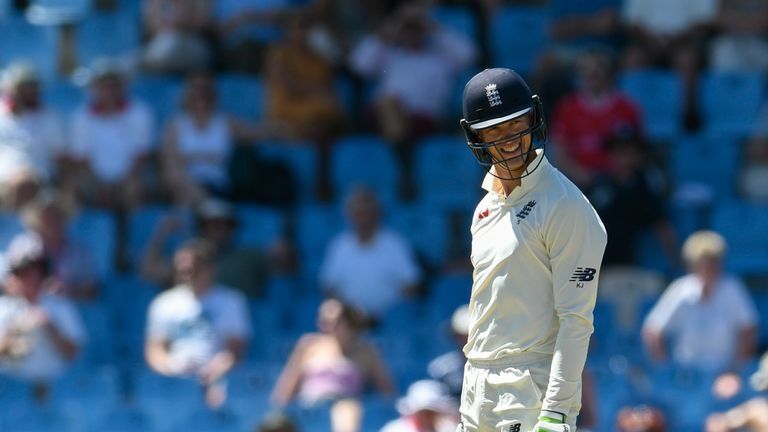 Joe Root reaffirmed his quality as both a batsman and a captain during England's Test win against the Windies in St Lucia, according to Sky Sports pundit Nasser Hussain. Root led from the front with an innings of 122 as England triumphed by 232 runs in the third Test - albeit with the series already lost following two heavy defeats to the Windies. However, Hussain felt the performance was an important one not only in terms of Root's century, but the way in which he led the England side to victory inside four days. "This wasn't a dead rubber for Joe Root," Hussain told Sky Sports. "He'd got no runs in the series and he'd been out-captained by (Windies skipper) Jason Holder. "Root has been outdone in every single department and he's come here and batted brilliantly. He's picked the right side and then there's the way he's used Moeen Ali and Mark Wood. "And the anger he showed with (James) Anderson the first over when Anderson wanted his fine leg wide - and he said 'no, I'm in charge'. I looked down from the press box and saw Joe Root in charge of the England side." Referring to Root's exchange with Shannon Gabriel on day three - which earned the Windies bowler an ICC charge - Hussain added: "He's been a good batsman, a good captain and yesterday, for 12 words, he was also a good human being." Hussain urged England to learn from their selection errors in the Caribbean, citing the omission of experienced paceman Stuart Broad in favour of the diminutive Sam Curran for the first Test in Barbados. Broad was later recalled along with Durham seamer Mark Wood, who had previously struggled with injury but impressed in St Lucia, taking 5-41 in Windies' first innings. Nasser Hussain says the packed county schedule means it is difficult for players to find time to iron out kinks in their technique. "We've seen this before - we've highlighted Wood and (Olly) Stone," he said. "The reason Australia won the last Ashes Down Under was because they had their full fast bowling quartet fit and firing and England didn't. "England have got to make sure for the first Ashes Test, first morning, more of their fast bowlers are fit than not fit. "Make sure you learn from this tour - a five-foot lad isn't going to be as destructive as Stuart Broad with 400 Test matches. As long as you're learning from your mistakes, that's all you can ask for." As well as Root, Hussain was also full of praise for Windies captain Holder, who oversaw victories in Barbados and Antigua but was then suspended for the final Test as a sanction for his side's sluggish over rate. He added: "In the first couple of Tests, what impressed me was their discipline and their captain - a captain that had been hammered over the years... 'was he the right man, was it too soon for him?'. "He has led by example and instilled a discipline in the side that has been lacking for years and, once the series was won, we actually saw a little bit of the Windies we expected where, if the game was going their way, they'd put on a fight - if not, they wouldn't be as good. "In one out of three matches they were the Windies we expected. In the other two they took everyone by surprise and, if you're a neutral fan of Test cricket, you hope you see more of that in the future." Watch the first one-day international between Windies and England live on Sky Sports Cricket from 2.30pm on Wednesday, February 20.